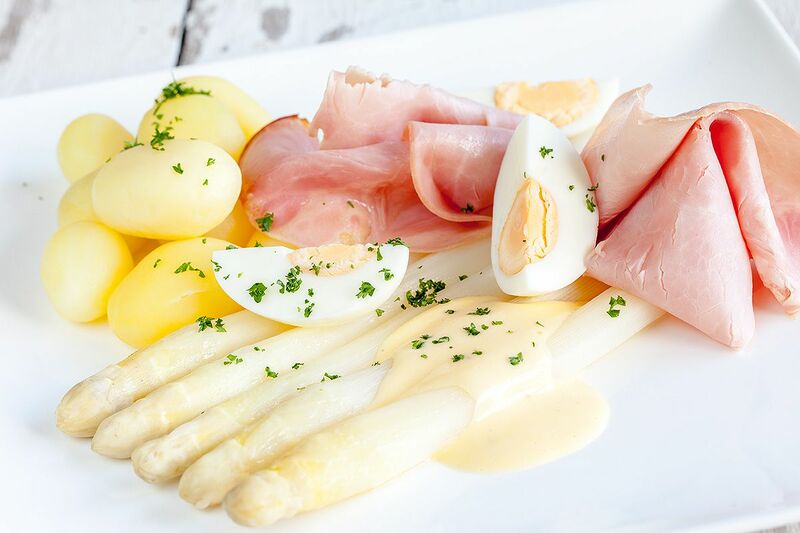 White asparagus and hollandaise sauce is a classic combination, served with a boiled egg, cooked ham and potatoes. Absolutely divine! 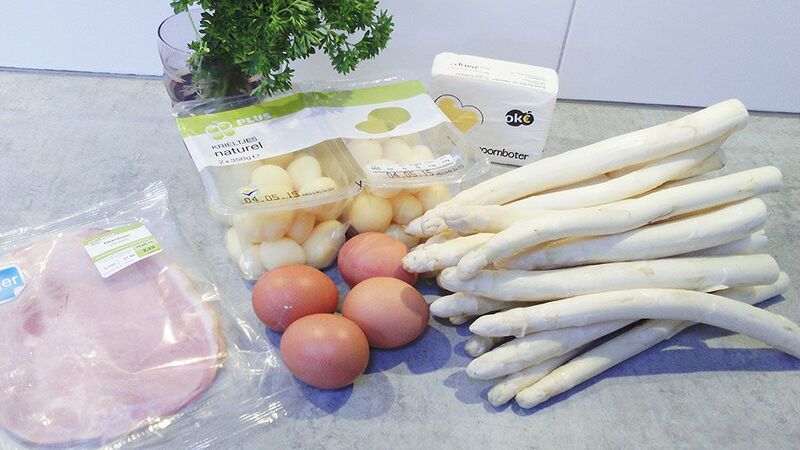 PEEL the white asparagus. Use your finger to feel if you didn’t miss any little piece, cause the peel will be very stringy. Chop of about 2 cm of the bottom and place the asparagus in cold water to prevent them from becoming brown. PLACE the asparagus peels in a large pan and fill it with cold water. ADD a little bit of butter and salt to it to create a flavorful water for boiling later on. REMOVE the asparagus peels from the large pan. Meanwhile wash and finely chop the fresh parsley and set aside. BOIL the potatoes for about 10 to 15 minutes. Poke them with a fork to make sure they’re fully cooked. BOIL the eggs for about 7 minutes. PLACE the peeled asparagus in the pan filled with the prepared water. Don’t let it come to a boil, let it simmer on medium low heat for about 15 minutes. They are done when you can slightly bend them. Turn down the heat and let them wait in the water until they are ready to serve. 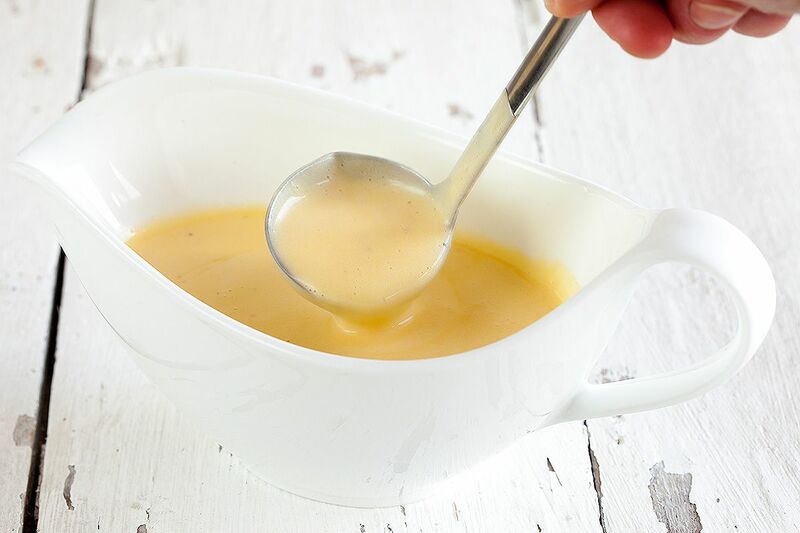 If you choose to make the Hollandaise sauce, you can check out our recipe for Hollandaise sauce here. If you rather not make the sauce, just make some clarified butter. 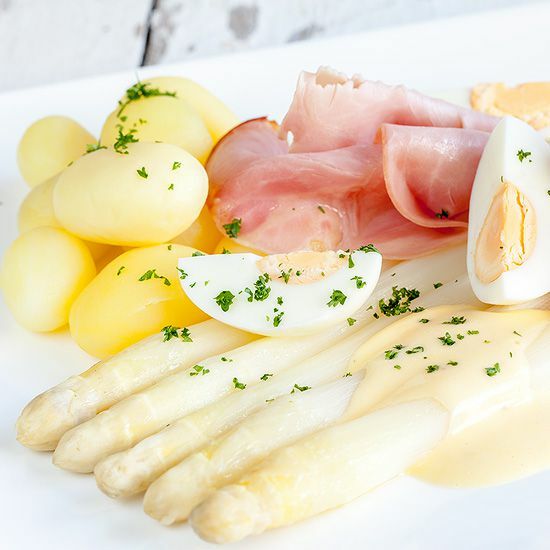 That’s also one of the traditional ways to serve white asparagus with. Add butter to a small saucepan and let it melt very slowly. You’ll notice some white substance is rising to the top. Skim the foam off using a spoon. The butter is now clarified and will look nice and clear. 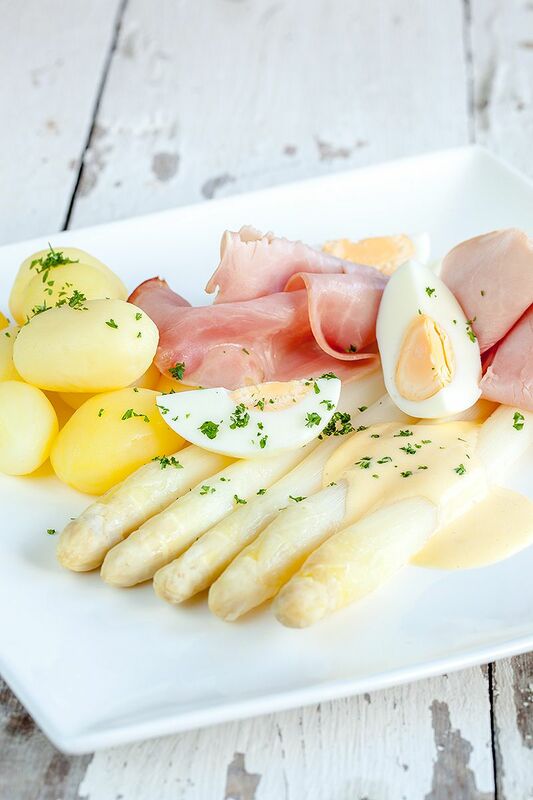 ARRANGE 5 white asparagus on a plate and slice the boiled eggs in quarters. DIVIDE the potatoes and cooked ham. Finish it off with Hollandaise sauce or clarified butter and chopped parsley.